The big man, Roy, is up to his usual tricks, make sure you collect your Roy banner and share a photo to social media using #SpottedWithRoy. Head over the Lions Shop at Gate 2 before, during or after the match to kit yourself out in maroon, blue and gold. Make sure you your New Era Lions Shop exclusive player designed caps at the Lions Shop or any Lions Shop outlet around the stadium on game day. Don't forget to also check out the new range of retro gear available in store now! Get your pre-game footy fix with our Brisbane Lions footy guru, Josie Fielding, coming live to the big screen from our sideline couch. Each home game we’ll chat to a Brisbane Lions coach, player and a special guest. Head on over to one of the best spots the Gabba has to offer at the top of Gate 7. The Laneway Bar located outside Section 52 will be open and will feature a live musician. The Bar is FREE to enter. All game entry members have FREE access to the Match Day Social Club - entry via Gate 6 or via the lift at Section 51. Proof of 2019 membership must be shown upon entry. Premium season reserved seat members and September Members have FREE entry to the bar located in Section 62. Entry to the bar is subject to capacity and proof of 2019 membership must be shown upon entry. Members can collect an exclusive 2019 Autograph Book this Saturday from the MemberHQ Marquee, Match Office 7 & 9 or the Match Day Social Club! Simply flash your 2019 membership card to receive your copy! *Limited quantities available, one per member per membership card. Support the Edmund Rice Foundation Australia by purchasing a ticket in Saturday’s 50-50 raffle. One lucky person will win 50% of the prize pool in the random draw at the end of the game. The remaining 50% will go to the Edmund Rice Foundation Australia. With your support, the Edmund Rice Foundation Australia can continue their vision for access to quality education and life-long learning opportunities for all, supporting empowered communities that determine their own futures. Tickets are available from only $5 - Grab yours now for a chance to win! Tropic Like It's Hot on the Verandah with The Brisbane Lions! Be seen at the city's hottest social event. It’s the most scenic Verandah in Brisbane - the view is second-to-none, we're not Lion. Do you fancy yourself as a quiz master? Test your skills on match day for your chance to win 2 x Area VIP tickets for a future Lions home game. If you stumble or need help with a question, our dedicated Hyundai Sales Manager Kylie Osborne will be on hand to assist you. Kylie is here to help with more than just trivia though, if you need help buying your next car, contact Kylie first to ensure you get the best deal. For you chance to play the Hyundai Hot Seat on match day, register at the Hyundai display in Lion Park between 5:30pm – 6:30pm this Thursday. Make sure you get to the Stadium early for your limited-edition Brisbane Lions schooner holder. Head to the Laneway Bar at the top of Gate 7 or any of the bars in Stadium to collect your schooner holder. *Conditions Apply. Pump up the Lions and you could be dancing your way on to our Big Screens. We’ll be doing an array of dances around the ground so make sure you sharpen up on your moves so you can cut some shapes when we cut to the PUMP it up! Dance Cam! With thanks to our Major Partner Oaks Hotels & Resorts, you could be kicking your way to a $1,000 Oaks stay! Simply register your details and we could be calling on you to take the field at quarter time. Stick around after the siren and have a kick on the ground, thanks to Macca’s Kick 2 Kick. Upload a photo of yourself having a kick and upload it using #maccasK2K for your chance to win a one-on-one kick with Lions superstar Cam Rayner in your own backyard! Thanks to the Brisbane Lions Coaches Partner, The Coffee Club, on match day or the day after any Brisbane Lions home games, you can receive a FREE small hot beverage from participating stores across Brisbane. Simply present your match day ticket or membership card to redeem on Thursday, 18 April and Friday 19 April, 2019. Do you want a chance to run with the bulls on game day and go in the draw to win $5,000 cash thanks to Jack Links? There are weekly prizes up for grabs and a major prize of $5,000 cash to be given away at our final game of the season. Enter online for your chance to be on-field at three-quarter time to run with the bulls. Forget about public transport, drive your car right up to the Gabba and stroll across the road to the game. Thanks to Hyundai, 2019 Brisbane Lions Members can park at The Gabba, just metres from the stadium, no matter what kind of car you drive! 20 lucky Brisbane Lions Members will be chosen and notified before each home game. For your chance to park in the Hyundai Car Park. Get rewarded for doing what you love! Attend all your eligible games to go in the draw to win tickets to the 2019 Toyota AFL Grand Final. Can't make it to a game? Give your membership card to a friend to stay in the running. Did you know you get FREE public transport to and from the game? Show your Brisbane Lions member card or ticket when getting on and off the Train or Bus and you’re set. Please call TransLink on 13 12 30 or visit translink.com.au to use their journey planner or view and print their maps and timetables. Thanks to Hyundai, 2019 Brisbane Lions Members can park at The Gabba, just metres from the stadium, no matter what kind of car you drive! 20 lucky Brisbane Lions Members will be chosen and notified before each home game. For your chance to park in the Hyundai Car Park. For all the latest updates on everything Brisbane Lions follow us on Instagram, Twitter and Facebook. 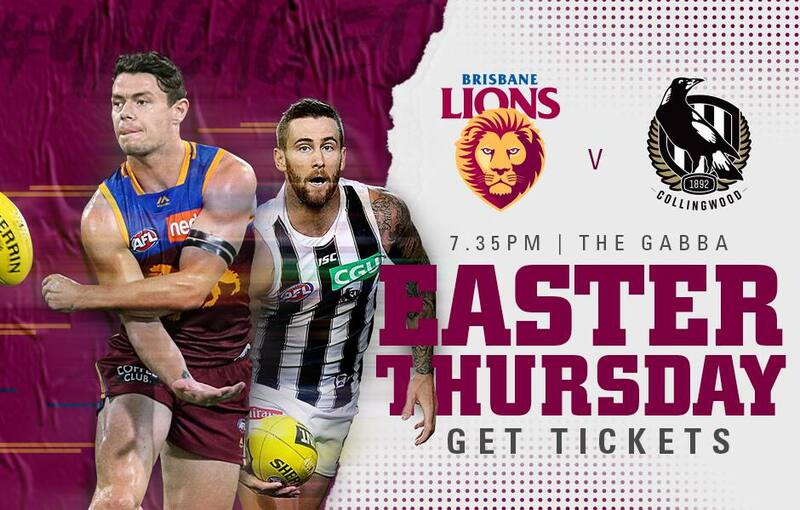 Join the Game Day conversations with #AFLLionsPies and join the Facebook Event.